Michelin Star-rated Executive Chef Juan José Cuevas believes in pairing social consciousness with exquisite taste. We place the highest value on hand-selecting products that are local, artisanal and homemade in order to craft food that is flavor-forward. Always fresh and with a contemporary flair, the food at Condado’s 1919 Restaurant is served with meticulous care and pride from our island kitchen to your table. 1919 Restaurant blends the experience of world-class dining with the flavor of locally-sourced ingredients. Savor artisanal delicacies served freshly -- and with a contemporary flair -- from our kitchen to your table. "We change the menu four to five times a year. My approach is simple: let the ingredient speak for themselves. We are always in continuous conversation with our local farmers to develop our menus. As for the tasting menu, we always begin light and simple and slowly gear up to more complex combinations: from barely touched to substantially enhanced in flavor. Condado Vanderbilt brings prestige, elegance, and finesse to 1919. The Condado area is busy, lively and close to everything. It is the best location to stay if you are in San Juan, PR. "- Nicole Haddad, Downtown Magazine NYC. Read more. "1919: Housed in the elegant Condado Vanderbilt Hotel, 1919 is helmed by Chef Juan Jose Cuevas, a Michelin-star chef and native Puerto Rican, who supports the island’s small farmers by buying their exquisite produce. Cuevas’ contemporary menu leans toward fresh local fsh and island specialties. Chef Cuevas helped feed thousands of hurricane survivors in the weeks after Hurricane Maria. "- Michael Shapiro, #FlyWashington Magazine. Read more. "After Hurricane Maria, the island’s farmers have made growing diverse produce—and sharing it with local chefs—their mission. At 1919, amid amber tones and elegant décor, Cuevas presents a contemporary menu that features mostly local fish and vegetables. One of his star dishes is wahoo with purslane, the succulent grown on Rodríguez Besosa’s farm. "- Michael Shapiro, Inspirato Magazine. Read more. "1919 restaurant brings a classic fine-dining feel to a waterfront space on the coast of San Juan, Puerto Rico. Set in the luxurious Condado Vanderbilt Hotel, the dining room offers stunning sights of the ocean, but guests can also take in the view of a floor-to-ceiling cellar. Chef José Juan Cuevas serves eclectic American plates, from small dishes like organic local beet salad and a trio of crudos to grilled meats with deletable add-ons like potato churros. "- Wine Spectator. Read more. “When I worked in New Jersey, I used to work with local farmers,” Cuevas says. “When I moved to Puerto Rico, my first job was to get in touch with the people who are working the land and who were willing to help me develop this restaurant.” His Slow-Cooked Salmon with Light Fricassee of Vegetables and Crushed Basil reflects his use of local ingredients in nontraditional dishes—an approach that has made his restaurant a popular destination for both locals and tourists.- Fran McManus, Edible Jersey. Read More. "I have said it before and I will way it again. 1919 is the closest you will come to having an experience up to par with a Michelin starred restaurant. It offers diners the complete package. the food, the wines, and the service are as close to perfect as can be. Chef Cuevas is undoubtedly one of the best chefs in Puerto Rico and pastry chef Fondeur is the queen of desserts. This is not your typical Puerto Rican restaurant, but they support our local product 100%. There is no better treat during this holiday season than to enjoy a proper meal at 1919. "- Myriam Ocasio, PR Eats. Read more. 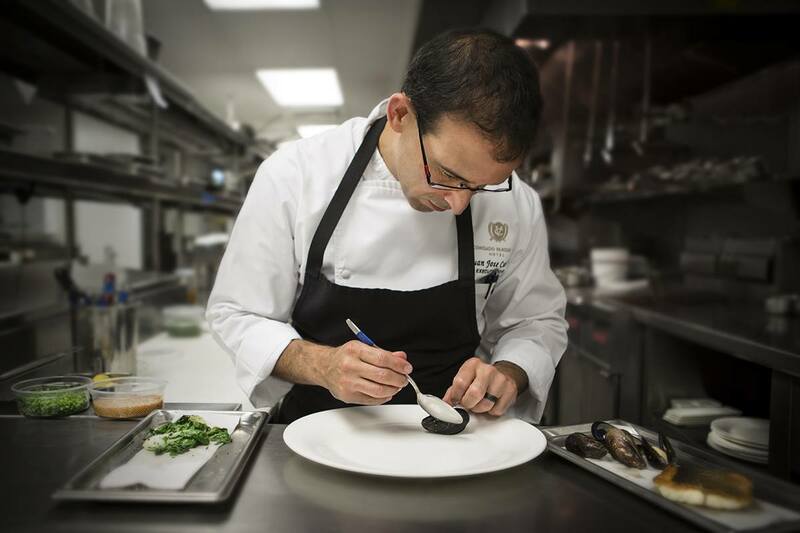 "Those who know the best chefs in Puerto Rico, know about the carats of Chef Juan José Cuevas, who since 2012 has been Executive Chef of the Condado Vanderbilt Hotel. When I do this affirmation, I am not limiting to his culinary talents, which have deserved him Michelin stars when he worked in other cities, but also because Chef Cuevas is an extraordinary human being, who with his professionalism impacts locals and visitors. "- Ivelisse Agostini, Placeres PR. Read more (in Spanish).